Rampage is big dumb fun. Most of the time it's not too dumb to have fun with. Occasionally it pushes envelope into dumbass territory. 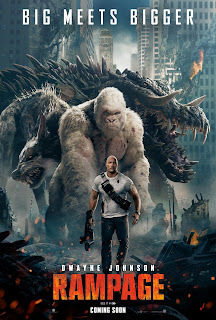 But the combo of The Rock's charm and some fun giant gorilla action makes it entertaining enough to enjoy with a big helping of irony. 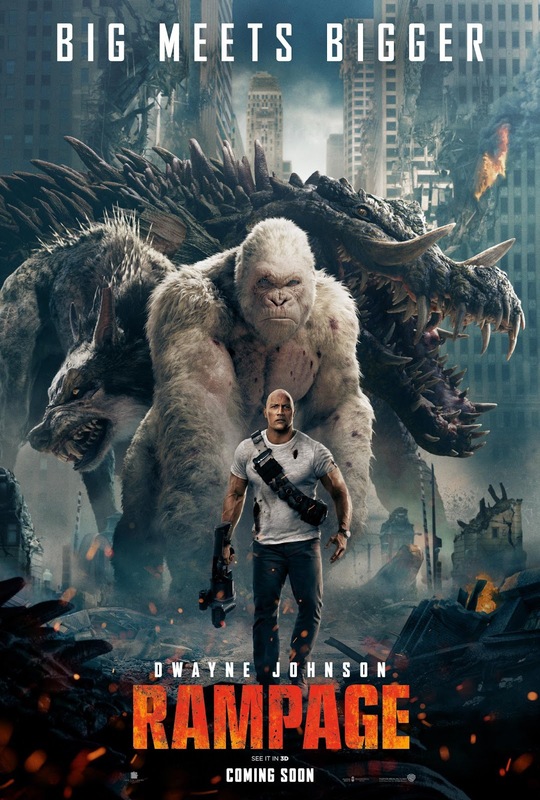 From the director of the truly horrible San Andreas, Rampage sees Dwayne Johnson as a primate handler who befriends an albino gorilla he rescued from poaches and now cares for at a wildlife preserve in California. Cheekily he uses the sign for "rock" as his sign name as he communicates with the intelligent gorilla with American Sign Language. An evil corporation is conducting nefarious experiments for profit and the gorilla, along with a wolf and an alligator all get infected with a virus which makes them grow to gargantuan size and become aggressive. Yes I know. It's all very ridiculous but the film remains straightforward and simple enough in its premise to just let you enjoy the, well, rampaging without having to think too much. As I said it rarely becomes stupid enough to take you out of the film but there are a few eye rolling scenes. However in the end it's the lightest of light entertainments, truly forgettable. Like cotton candy and about as substantial. So this isn't one for the history books or anything but if you're looking for simple pleasures you could do worse than Rampage.